The question that Einstein could never answer was how can a classical system be inherently statistical. The solution is in the Lightspeed Expanding Hyperspherical Universe. Consider a Borh atom, or a Hydrogen atom. At each and every de Broglie step in the stepwise expansion of the Hyperspherical Universe electron will change position and velocity. The Quantum Lagrangian Principle - the one that states that a dilator will always dilate in phase with the local dilaton field - ensure that the dilator will always surf the dilaton field projection onto the 3D Hypersphere. If you are near-sighted on your mind-eye and only can see the 4D Spacetime - the left panel in the figure above - then you will only see the overlap of the dilaton field with the 3D space. The dilaton field from the nucleus is circular and can be considered to be perfectly round or equivalently. Now let's consider an electron on its trajectory falling into that nucleus. On first approximation, its dilaton field projects onto the 3D Universe as plane waves with its corresponding de Broglie wavelength. 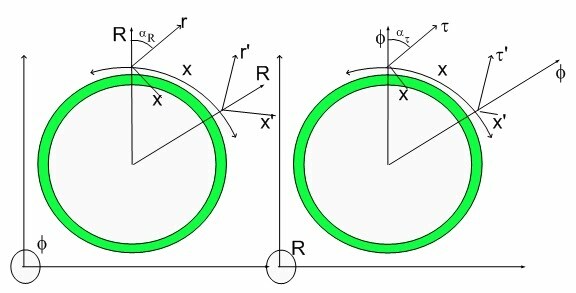 The interference between a flat wave and a circular wave is a circle. This means that the next step on its surfing is not well defined and only can be modeled statistically. This simple figure is what Einstein and everyone else missed when they tried to make the transition between Classical and Quantum Mechanics or to build Quantum Mechanics from Classical Mechanics. There is no way to avoid statistics or wave mechanics. That is what Einstein refused to accept due to ideological, religious or aesthetic arguments. By missing a non-compact spatial dimension, Einstein and everyone else missed the opportunity of understanding how quantum mechanics could be derived from classical mechanics.